It is the hardest question to answer, “when does an exercise go from being corrective to strengthen-ing?” The challenge in answering such a question relates to the same issues in addressing “functional training.” Without a clear and agreed upon definition of the subject, it leads to a lot of different inter-pretations of the concept. We can see this where the National Academy of Sports Medicine looks at corrective exercise as, “the systematic programing process used to address neuromusculoskeletal dysfunction through the use of inhibitory, lengthening, activation and integration techniques” (NASM Essentials, 2011). A very de-tailed definition for sure, but as we look at such a definition does this mean that our “strengthening” drills should not possess the same qualities? Develop a clear understanding of the role of corrective exercise. Understand how to build clear progression in functional patterns. Learn how to apply specific training variables of movement in creating corrective exercises. The struggle that many in the therapy, fitness, and performance fields face comes from understanding how corrective exercise fits into our programs and whether or not all exercise be corrective. If we be-lieve that the goal of corrective exercise is to correct movement dysfunction, then should we look harder to make sure that any exercise we use aims toward improving movement? In our Dynamic Variable Resistance Training system (DVRT™), strength is not looked upon as simply an expression of force or power, but rather with the goal of improving movement efficiency. After all, what is the goal of becoming “stronger” in sport or life? The focus of strength is to improve the effi-ciency in which we create both every day and sporting movement. These types of discussions are important because they solve many issues that face not only corrective exercise, but functional training in general. Debates about the necessity of corrective exercise, its ef-fectiveness in not only resolving movement issues, but increasing performance, and the actual pro-gramming of corrective exercise becomes moot if we understand the desired outcome of greater movement efficiency. What Makes an Exercise Corrective? The mistake many make in corrective exercise is thinking of it as only therapeutic exercise. While there may be crossover, such a philosophy is as general as stating that weight training exercise builds strength. What type of strength? Strength in what capacity? Therapeutic exercise can and should look globally at movement, but may be isolated as well. Correc-tive exercise tends to examine the movement pattern to find where the issue in movement efficiency lies. If this sounds like semantics, it is anything but, as it can drastically change how we progress and prescribe exercise. My goal in writing this article is to actually deter you in the long run from using the term, “corrective exercise.” That is because all our exercises should be designed to improve movement and instead of compartmentalizing specific exercises as “corrective,” “strength,” etc., they sit on a continuum of movement development. The goal of the practitioner then is to decide where on the continue the in-dividual is ready to perform. Using DVRT principles can be used as direction upon which to help identify and progress people along this movement continuum. These variables we will focus upon are load position, plane of motion, body position, and stability of implement (this comes from dimension as well as internal loading). The goal is not to randomly apply these concepts, but rather, systematically assign them to our training so that we can watch for incremental progression in movement competency. We can simplify correc-tive and strength training while also feeling confident that we are assigning the right progression of movement by using this simple system. In order to illustrate how effective and simple this system can be in yielding high level results, let’s take a few examples from Dr. McGill’s list of fundamental movement patterns. For the sake of this article, we are going to focus upon the squat, often considered the most fundamental movement pat-tern. The squat is a great illustration of the dilemma that face most practitioners. It is movement pattern that should be fundamental, yet, due to our lifestyle, is quite complex for many to achieve proper pro-ficiency. To make matters even more complicated, there are no shortage of “corrective” programs for the squat; however, the problem may not be in trying to solve all the issues of the squat, but using the right squat. Squatting is a lower body based movement so it falls into our philosophy in DVRT™ of changing holding position before body position when it comes to load placement. We are looking to make the most in-cremental change to a movement in order to increase one’s movement skills. 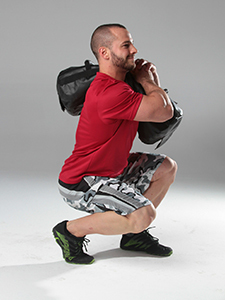 The first holding position of load will be actively pressing the weight out as we squat. Yes, we are going to use load to teach proper movement in the squat. The idea of mastering bodyweight before apply-ing load may sound like a great idea, however, most clients do not have the body awareness to effec-tively achieve this goal at the start. We can use load as a very valuable feedback tool. The Squat Press Out works so effectively because it not only creates a counterbalance, but has the individual actively use the lats and core while they squat. Even though the squat is a dominant lower body exercise, the core and lats are crucial in squatting success. This makes sense when we look at both the Posterior Oblique System (POS) and Anterior Oblique System (AOS) that physical therapist, Diane Lee, describes in her book, The Pelvic Girdle: An integration of clinical expertise and research (Lee et al., 2011). Understanding these “sling systems” helps us understand that no movement is isolated or segment-ed; rather, all movements are highly integrated actions of all segments of the body. Therefore, teach-ing people how to efficiently use the entire body to perform a movement pattern is going to create a far more power action than trying to break down the individual components of the exercise. The recent popularization of the kettlebell or dumbbell Goblet Squat has been a very positive move in helping people understand proper movement mechanics. Not only does the Goblet Squat spare a lot of backs, it teaches how to load the lats and core to create a better squat. Conceptually, the Goblet Squat is a fantastic exercise. Some issues do arise from the fact that load is an important variable. Too light of a load doesn’t do much to provide the body feedback and improve the quality of the squat. When load increases, the leverage of the weight on the individual can be problematic as it becomes more reliant upon the upper body versus loading of the core and lower body. That is where the Bear Hug Squat can be a very viable solution. The ability to make the weight part of the body allows us to have all the great aspects of the Goblet Squat, but negates the issues that arise with the Goblet Squat as well. 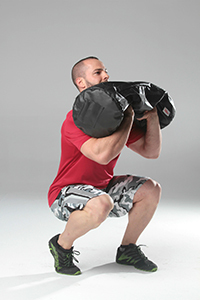 The Bear Hug also allows us get a better squat the more load and dimension we use. Where load typi-cally starts to negatively impact movement, but in the Bear Hug Squat it actually can enhances the movement due to the feedback of the load and dimension. Instead of just going heavier and heavier or more volume, we can alter load placement once again into what we call a Front Load position. Moving the load up our center of mass creates a standing plank. We not only change the stress upon the lower body, but the kinetic chain of the core and lats as well, mak-ing exercises more challenging by placing more of a stress on the chains to maintain the connections. The last holding position we will focus upon is the Shoulder position. Once again, a simple appearing movement that possess many nuances that give it great power. The Shoulder position totally moves away from giving feedback and the first time gives the squat a multi-planar movement. Due to the body needing to resist lateral flexion and rotation, we have a more complex and sophisticated squat-ting movement. This is where strength and “corrective exercise” really blend seamlessly; we are not only challenging our ability to lift a weight, but maintain a movement under different stresses of the planes of motion. That allows us to use the Shoulder Squat not only as an exercise, but a functional screen of more real world activities. An example of this is gait, where we not only move through the sagittal plane, but have to resist frontal and transverse plane forces. During this progressional series, we have an opportunity to use load position, changes in load, and vol-ume to build greater proficiency. This is supposed to also give us direction for more sophisticated movement patterns. One example would be moving the body position, which has a more profound impact upon our stress on the kinetic chains and learning how to resist as well as produces great levels of force. That brings us to the Sprinter Stance Squat. Before the time of squat racks, many old-time lifters had to create innovative means in stressing the squat because huge barbells were not possible. This led to better ways of training because the emphasis wasn’t only load, but the quality and type of movement as well. The Sprinter Stance introduces frontal and transverse plane forces, builds incremental instability, and allows us to build upon the squat pattern leading to more complex patterns. Ironically, it often feels more awkward to those with long fitness backgrounds than new clients because those that have trained for a long period of time have ended up programming a very specific type of squat instead of a broader level of squat competency. The term “corrective” has long bothered me; what does it mean for movements that do not fall into the corrective category of exercises? Sometimes practitioners sacrifice quality of movement in the name of strength, power, and force, yet, they fail to realize that the same goals they are striving to achieve are all based upon the individual’s ability to perform all movement at the highest level. That is why the goal, no matter if “corrective,” “strength,” or “performance,” should be achieving the very best of movement efficiency. McGill, Stuart. BackFitPro.com. N.p., n.d. Web. 01 Sept. 2016. Lee, Diane, Linda-Joy Lee, and Andry Vleeming. The Pelvic Girdle: An Integration of Clinical Ex-pertise and Research. Edinburgh: Elsevier/Churchill Livingstone, 2011. Print. Jessica Bento, co-owner of Innovative Fitness Solutions, obtained her degree in Physical therapy back in 2006 from Wayne State University. In her clinical experience Jessica has had the opportunity to work in every facet of physical therapy, from sports orthopedics to geriatrics; which has allowed her to broaden her skills as a therapist. 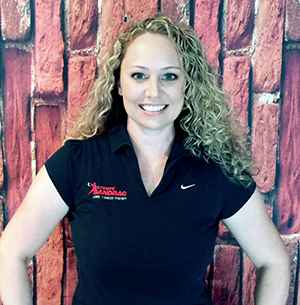 Beginning in 2008, Jessica took the role of Director of Education for Ultimate Sandbag Training and DVRT Fitness. 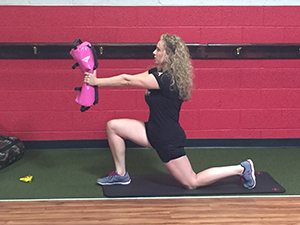 Using her skills as a physical therapist she has been able to help grow and expand the education at DVRT Fitness and help to provide more clinical and evidence-based content.